This poetry compilation focusses on metaphysical topics of a primarily philosophical and psychological nature. It develops from rudimentary physics to complex abstract concepts through the volumes. There are also inspirations from other poets. I hope, since there is always hope, you are inspired as I have been by such topics. 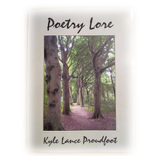 Poetry Lore is published by AuthorHouse UK and is FOR SALE at Internet Booksellers such as Amazon. Mass Energy, The Death-Life Conspiracy means exactly such for dualism is intrinsic to the nature of reality itself; is everything actually real and/or not real, dream and/or wakefulness, good and/or evil, negative and/or positive, man and/or woman, up and/or down... regardless of how you look at anything you can never avoid the definition of the dualistic basis of all of existence laid down by Pythagoras and others. This volume of poetry presents this theme in eloquent verse. The Power Of Release strives for the pinnacle point of pressure and release where the stored energy is let free and all the tensions subside. Also it takes the next step in metaphysics developing on the original dualistic theme to a more esoteric and exoteric experience of what, when, where, who, why, how is reality.